blog.HalloweenAdventure.com | Latest News from the Costumes Trend FrontLines! : Pet Costumes! If you’re one of those people who can’t live without a pet (don’t worry, we’re one of those people too), you probably own multiple outfits for your dog/cat/hamster. Once again, don’t worry; we do too. Which is why we’re sure you’ll love our selection of pet costumes. We’ve got everything from Army Pets to Pirate Pets, from Superhero Dogs to Raggedy Ann Cats. No matter what you’re in the mood for, we’ve got a costume for you and your little one. 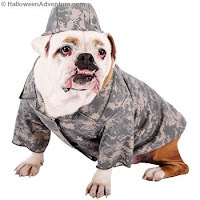 Your pit bull will love totally badass in our Army Grunt Pet Costume. This camouflage outfit with a little jacket and mini helmet are perfect for all pets with a little bit of sass. Is your family a bit fan of The Dark Knight? Who isn’t? Make life "ruff" for the Joker with this cool Batman: The Dark Knight Batman pet costume. Make no bones about it, Joker, this heroic hound is ready to sink his teeth into adventure! Pay homage to teen vampire romance Twilight (the one your kids have seen “only like a million times, mom!”) with this Dogula Pet Halloween Costume. 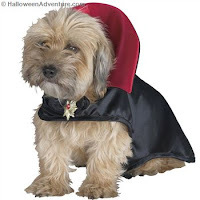 With a black satin robe, exaggerated red collar and gold medallion, your pooch will be vampire royalty in no time! Ahoy, matey! It’s a pirate’s life for this pooch! 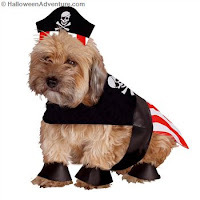 With our Pirate Dog Pet Costume, your pup (or cat) can show the people of the sea who’s boss. Costume includes: robe with imprinted skull & cross-bones, attached pleather belt, coordinating headpiece, and four paw covers. Is your pup in the doghouse? Send him to the Bad Dog Penitentiary with our Prisoner Dog costume. 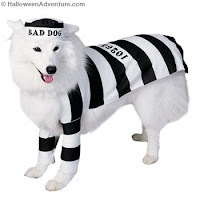 This hilarious black and white striped costume even comes with a little hat labeled “BAD DOG” so he knows he’s in a bit of trouble. For more fabulous pet costumes, check out our wide selection in our online store! Remember, you can also always visit us in person at one of our many Halloween Adventure stores. Simply head over to the Halloween Adventure homepage and input your zip code into the search box on the top right hand corner. Happy shopping!